I recently stumbled upon a new WordPress plugin called MemberPress that would end up becoming an integral part of my website. This plugin would not only provide the basis of my future membership website, but is also being currently used to host both of my products – my book, and my video course. I have spent a lot of time with the plugin so far and while I still have a lot to learn, I know enough to give a fair review of MemberPress. If you’ve been sitting on the fence with MemberPress or you just want to know more about it, read on. There’s a lot to cover! The primary function in MemberPress is that it acts a protector for content, requiring payment for access. As far as handling payments go, you have three options. PayPal, Stripe, or Authorize.net. I personally use and recommend Stripe. Setup takes about 15 minutes and runs flawlessly. Pricing your product is easy. You type in how much you want to sell it for, whether you want it to be a one-time or recurring monthly payment (such as for a membership site) and whether or not you want product access to expire. This could be useful in a free or reduced price trial, for example. Rules, Rules, And More Rules! Access to products is controlled by rules. Rules determine what content is accessible, and to whom. For example, I can make a rule that only allows people who purchase product X can access pages Y and Z, for example. When somebody who hasn’t bought the product tries to access the page, they are greeted with a nice page telling them to log in. At first, I was a bit annoyed by the fact that rules are such a huge factor behind protecting your content. However, when I took the time to think about it, there aren’t really any better ways to handle it. Because you can create rules for so many different scenarios, protecting content is actually pretty easy. For example, one rule allows you to protect all content tagged with a certain tag, and only give access to that post for people who have purchased X product. Let’s say that product was a membership site. I could tag all my membership posts with a members tag, and then create a rule that hides that post from anybody that doesn’t have access to that product. Within the member’s dashboard, they could immediately access all the members only post, making it easy to see the content they purchased while hiding it completely for regular users of your site! Another feature that people running membership sites will love is the ability to drip content. This means you can make content accessible to members a certain number of days after they register, rather than giving them access to everything at once. This keeps people subscribed longer, and also prevents people from downloading your content and unsubscribing. This was a huge reason why I purchased MemberPress, and unfortunately I couldn’t find a lot of information on the subject before my purchase. Fortunately, MemberPress and Amazon S3 was a great combination to host my video course. In fact, all I had to do was put my AWS keys into MemberPress, upload the videos to my server, and type a shortcode in to display them. Many other plugins require you to purchase additional plugins or software to stream the course on your site. MemberPress allowed me to use S3 right out of the box, preventing me from having to spend another $200 a year for Vimeo Pro! Other MemberPress Features Worth Mentioning! Create specific coupon codes to give discounts on your products. These coupons can be global (work for all products) or restricted to a specific product. You can also create coupons that expire after a certain period of time, or a certain number of uses. I give my email subscribers a global coupon code for discounts to all of my products, so be sure to opt-in if you haven’t already! MemberPress integrates flawlessly with Aweber, GetResponse, and MailChimp. I personally use and recommend GetResponse, which in my opinion is the best email marketing service available. This one really makes your website look professional. A welcome email when a member signs up. A purchase receipt for every new purchase. While I haven’t tested this myself, MemberPress claims that the plugin integrates perfectly with common forum management systems like BBPress or Simple Machines Forum. This allows you to host private forums on your site for paying members if you wish to do so! This is actually what caused me to pull the trigger and finally purchase the plugin. Bundled with MemberPress is an extra plugin called Affiliate Royale. Affiliate Royale allows you to set up and run your very own affiliate program alongside MemberPress, integrating with your products automatically. Set a percentage or flat fee for affiliate sales. Choose whether or not you want recurring transactions to pay out commissions. Set a minimum payout for affiliates. Create an affiliate resources page. Send emails automatically when sales are made, or for other account issues. Set your own cookie length. Affiliates have their own affiliate dashboard! Referral program – affiliates can earn commissions for sales by other affiliates they refer. This is customizable up to 100 levels! View how affiliates are performing, referral information, etc. One thing I love about Affiliate Royale is that affiliates can link to any page of your website using their affiliate tracking code, and still get credit for any sales made. This makes it easy to link to a pre-sell page or article that discusses the product, rather than having to link to the sales page itself. I am still setting up the affiliate program on my site so I do not have experience managing a large number of affiliates, but all tests that I’ve done have correctly credited affiliates for the sale so I have complete confidence that Affiliate Royale is a great option for anybody selling digital products on their site. In the end, MemberPress is a great option for anybody who wants to run a membership site, or even just anybody that wants to sell their own products through their site without relying on another company. The incredible number of features allow you to offer a highly customizable membership platform without disrupting or annoying your regular website visitors. In addition, easy integration with payment processors like Stripe or PayPal make the buying experience for your customers quick and easy. When you combine MemberPress with the Affiliate Royale plugin that comes along with it, you have the ability to grow a team of affiliates marketing your product for you. Needless to say, all of this makes it very easy to sell a lot of products, very quickly. While the plugin does take a while to fully understand, once you’ve figured everything out, there aren’t really any better options available. For the low price of $99, it doesn’t really get much better than MemberPress! Click Here To Learn More About MemberPress! Thanks for the skinny on Members Press. I know you well enough that you do your homework and test things out before you tell us about it. This looks pretty darn good to me. When I got to the part about Affiliate Royale my wheels started to spin. I’m doing more affiliate marketing these days and this looks pretty amazing to me. I like the way you had done this honest review. I am putting it on my Evernote right now to take a closer look after blog hopping. Yeah, I was actually pretty worried before purchasing because I saw quite a few negative reviews on MemberPress but it’s done everything I wanted it to do and more so I don’t get what all the fuss is about. Then again, a lot of those reviews were over a year old so maybe it’s just that much better now in 2015. Affiliate Royale was the seller for me. It integrates perfectly with MemberPress. Installing is as easy as uploading the plugin and checking a box, and then of course setting all your options and settings. I like keeping everything on my site and having complete control over everything but the payment processing (too much work and liability there.) The less third-party services I rely on, the better! Your review of MemberPress is quite thorough and I must say, I am already considering it. In the past, I sampled many membership plugins but discovered to my dismay that many of them did not suit my needs…it was quite a waste of time and really frustrating. I may wind up getting the plugin again for the other component, Affiliate Royale: as a product creator myself, I believe it’s time to take things to the next level! This review of yours, certainty puts things into perspective. Kindly ensure to make the day great! I have to admit I haven’t used any other membership plugins myself but I did research them all in detail before making my purchase. I chose MemberPress because it had everything I wanted, and seemed like a complete solution both for hosting my products and my membership site that will come sometime in the future. So far, I’ve yet to be dissappointed. Affiliate Royale is definitely something I would have paid extra for, because it adds that much value. Having your own affiliate program really ups the potential to make a killing with each of your products, because we can only do so much marketing on our own right? If you have any questions about either plugin please let me know and I’ll answer them to the best of my ability. Good to see you again Akaahan! Thanks for giving the word out on memberpress. This sounds like a great option for those that want to manage payments and what members can access . It sounds like it gives you total control so you don’t have to rely on any other sites as far as customers and affiliates are concerned. this would be something great for me to look into the future! Have a great weekend! Yeah, being able to keep everything on your own site is really nice. You don’t have to worry about other services going down or changing their rules, which can be annoying. With MemberPress the only third-party service you have to use is a payment processor, but who wants to manage their own payments anyway? That sounds like a liability nightmare and I know there are a ton of legal rules you’d have to comply with. No thanks. I previously used Selz to host my book but self-hosting gives you so much more freedom. MemberPress is definitely a good option for anybody who has products to sell, or content to protect. Thanks for stopping by Sherman! Good review. 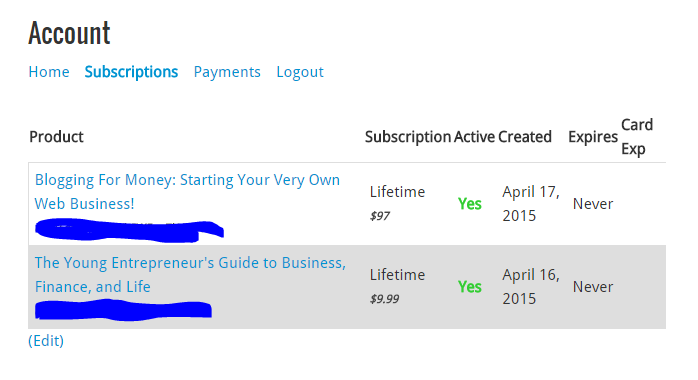 I recently purchased Optimized Press but this was one of the membership plugins I looked into. It seems pretty good and simple. I’m learning the ins and outs of OptimizePress but I would consider this to try out for a few niche sites I’m considering. Good review.